The Grafton Centre ran this event on the themes of energy, water and waste and the energy group ran a stall over the whole 2 days. We had something for everyone: the fruit map showing where people can pick fruit and stop it going to waste, the renewable energy fact sheets, some plug in energy monitors and appliances to demonstrate them with, and the new energy quiz (that's the coloured cards in the second picture). Nicola brought some signed copies of her book, with �1 going to Transition Cambridge for every book sold. This forum was for people wanting advice about stopping up draughts, and how to achieve safe levels of ventilation without wasting so much heat. Expert speakers Margaret Reynolds (architect) and Peter Pope (air tightness tester) explained what to do and how to do it, while householders Sheila Stickley and Susie Webb answered questions about their DIY experiences. Anglia Property Preservation and Ventrolla were also on hand offering their advice on ventilation and sash windows. Anglia Property Preservation offering advice. Ventrolla showing how they draught strip sash windows. Ridgeons, the local timber and builders merchants, celebrated their centenary this year and amongst many other activities on the day they presented Transition Cambridge with ten trees, to be used for the benefit of the community. The trees are young hornbeam saplings - an often under-appreciated native species renowned for very hard wood (sometimes used for butchers blocks and pulleys and other items which take a lot of bashing). Our trees will contribute to biodiversity and the enjoyment of Cambridge residents at Wandlebury Ring. Jon Gibbs, ranger has promised to find them good places in the nature reserve there. This picture shows from left to right: Kitchen and Bathroom Showroom Manager Francilina Liston, Teale Phelps Bondaroff from Transition Cambridge, Kitchen and Bathroom Showroom Supervisor Karli Hammond, Jon Gibbs from Wandelbury Country Park, and Cromwell Road Branch Manager Gus Chichon. 172 people signed pledges to take specific actions on reducing food waste at the CaSFA stall at Feast East (with the added motivation of a chance to win an organic vegetable box donated by Waterland Organics. Marie-Ann Ha's talks were also very popular attracting 100-110 people over the two days. The CaSFA stall was part funded by Love Food Hate Waste Comumnity Action Scheme. 70-80 people came to this forum which was all about installing solar PV panels. There are more details here. 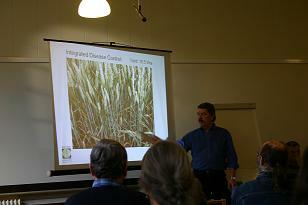 This event was run by Cambridge Sustainable Food Alliance (CaSFA) of which Transition Cambridge food group is a member. This was a great event, with 4 speakers talking about the future of food from scientific, permaculture and farming perspectives, and two workshops where people got the chance to discuss the role of science in the future of farming, and how we can maintain food security in Cambridge. More info here..